HOW TO DRIVE A PRINT DESIGNER CRAZY!!! “Great print and web design has a lot in common. They both require solid skills in typography, color and layout, to name just a few. But there’s a few ways in which the two fields are completely unique. If you’re a designer who works primarily with the printed page, we want you to know we feel your pain. Here’s a list of annoyances that only print designers will truly get. Let us know in the comments any that we’ve missed. Alt Press Fest is coming to The City Library on Saturday, July 18. Check out this annual event to celebrate all forms of alternative press and the local artists who create it. Please visit – slcpl.org/altpressfest for more details. 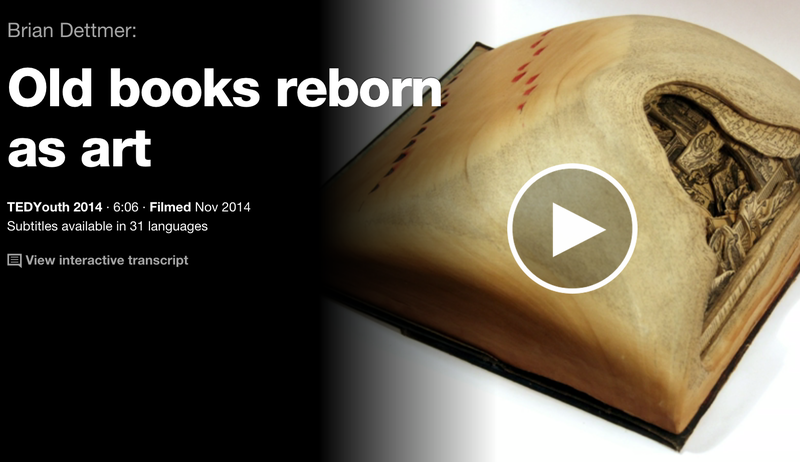 The Drinkable Book is both a water filter and an instruction manual for how and why to clean drinking water. This technology (pAge drinking paper) uses a thick, sturdy sheet of paper embedded with silver nanoparticles, which are lethal for microbes. This paper was created and shown to be highly antibacterial during Theresa’s Ph.D. at McGill University. $25 donation will include a sample of the paper. This is a very interesting presentation. In this video Brian Dettmer explains how he creates his book sculptures. PrintingFilms.com was established by Doug Wilson in 2012 after his work as director and producer of Linotype: The Film. During the filming process, Doug was given a box of 16mm Linotype promotional films by Dave Seat for digitization. In 2013, Carl Schlesinger (a former Linotype operator at The New York Times) donated his extensive collection of films to The Museum of Printing which assisted in the preservation of these films in 2015. The next big thing in children’s literature isn’t necessarily an imaginative story or lush illustrations. In fact, if you’re looking for a particularly innovative children’s book, you might not even find it on a bookshelf at all. Instead, try digging in the ground. German designer Peter Dahmen creates pop-up paper sculptures that open to reveal astonishingly complex forms. Dahmen talks about his artistic process and demonstrates a number of his beautiful sculptures in the video “The Magic Moment” by filmmaker Christopher Helkey. Dahmen posts videos of his sculptures on his YouTube channel.